The Johns Hopkins team’s product, the Antenatal Screening Kit, was selected from among video entries by university students on three continents who entered a global competition sponsored by ABC News and the Duke Global Health Institute. The winning kit uses felt-tip or ballpoint pens filled with testing solutions to make a mark on a strip of paper, which is then exposed to a pregnant woman’s urine. If the mark turns the color of the pen’s cap, the test is positive. The students have been refining and testing pens to detect early signs of eclampsia, malnutrition, gestational diabetes and urinary tract infections at a cost of less than a penny per test. They are also working on simple blood tests for jaundice and anemia. The graduate students who developed the prizewinning Antenatal Screening Kit are, front row from left, Matthew Means, Sherri Hall, Mary O'Grady, Shishira Nagesh, and back row, from left, Peter Truskey, Maxim Budyansky, Sean Monagle, James Waring. Photo by Will Kirk/Homewoodphoto.jhu.edu. The kit is considered significant because if left untreated, these conditions can jeopardize the lives of the mother and her unborn child. The pen tests, which require little training for use by health workers in remote areas, are designed to provide an inexpensive early warning that could coax an expectant mother to seek treatment at a clinic or hospital that may be many miles away. As grand prize winner, the Johns Hopkins team will receive $10,000 from the Lemelson Foundation, as well as mentorship and support in development, marketing and distribution of their invention. Team members will also present their idea before global health experts at a conference in November in Montreal. 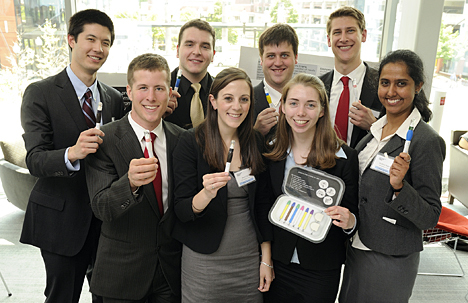 The Johns Hopkins team is composed of eight biomedical engineering students enrolled in the university’s one-year master’s degree program offered by the Center for Bioengineering Innovation and Design (CBID). The center is affiliated with both the School of Medicine and the Whiting School of Engineering. The team members are Maxim Budyansky, Sherri Hall, Matthew Means, Sean Monagle, Shishira Nagesh, Mary O’Grady, Peter Truskey and James Waring. The team’s clinical advisors are Soumyadipta Acharya, graduate coordinator of CBID, and Harshad Sanghvi, vice president and medical director of Jhpiego, a non-profit Johns Hopkins affiliate that administers international health projects. Monagle, 23, unofficial leader of the student team, said the Antenatal Test Kit originated three years ago, when he was part of a Johns Hopkins undergraduate biomedical engineering team assigned to develop a low-cost urine test to detect protein associated with pre-eclampsia in pregnant women, a task proposed by Jhpiego. When he entered the master’s program last summer, he and his 14 classmates were sent to India, Tanzania and Nepal to observe global health problems firsthand. At a hospital in Nepal, Monagle, with help from Jhpiego, was able to conduct further studies on the pre-eclampsia test. Work on additional Antenatal Screening Kit components resumed when the students returned. Sanghvi added that the ABC News prize, together with several other awards the students have won, is a recognition that engineering for global health solutions is coming of age. He said the partnership between Jhpiego, which has a presence in 50 countries, and the Johns Hopkins Center for Bioengineering Innovation and Design provides a perfect opportunity for the creative energy of bright student teams to make a massive difference in the global health space. “These technologies are custom-built to overcome the challenges of fragile health care systems and will make a big difference for women and newborns most in need,” Sanghvi said. Last fall, Jhpiego received a $100,000 grant from the U.S. Agency for International Development to continue its work in developing the self-test for early detection of pre-eclampsia, a project being conducted with Monagle and his teammates. As they expanded the Antenatal Screening Kit project, the students have collected about $50,000 in additional funding through business plan competitions and grants. The Antenatal Screening Kit was among the graduate and undergraduate projects presented May 9 at the university’s Biomedical Engineering Design Day. The kit received the first-place People’s Choice Poster Award, the result of voting by those who attended the event.